God calls all women to some level of leadership. Yet seeing yourself as a leader, discerning what one is meant to do, and navigating one's role as a woman and leader can be a challenging task. 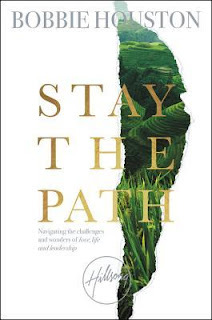 Drawing on the wisdom of 40 years of ministry, Bobbie Houston helps all women to discover their specific purpose and divine calling in STAY THE PATH. She shares the truths and experiences that have kept her and her husband, Brian Houston, on course, on point, and focused on the path before them. Readers will be able to recognize and believe in their unique gifts. Packed with personal stories, helpful advice, and leadership strategies for women, this book will challenge readers to claim their God-given potential and lead with confidence, poise, and grace. Bobby Houston brings leadership and sends a powerful message in "Stay the Path", which is ground in scripture. I find this book to be for the ordinary woman seeking to bring her passions to light. I love how authentic Bobby is in bringing her own journey in this book, which makes her so relatable and tells the reader that she is not alone either. Leaders can start out strong, but few will continue for years to come, Bobbie continues to show what strong dedicated leadership looks like and she continues to endure the race. I love how her life is lived out through this book and it extremely challenging to read, watch, but also encouraging at the same time. I could just gush about this book. The second half of this book was my favorite, but overall, this book was just wonderful from beginning to end! I especially loved chapter seven where she talks about how wisdom is costly. I whole heartily agree with that statement. So much pain and trials people have had to go through, especially pastors have had to go through in order to gain wisdom. I just love the perceptive of this entire book! It has so so many great truths about leadership in general! You just have to grab a copy! I give this book 5/5 stars. This is a book that will stay on my shelf. Thank you to the publishers for providing me a complimentary copy for review purposes only. To Purchase a copy, click this! To Find out more about Bobbie Houston, head here! I love Bobbie, so much wisdom from one woman. I want to read this one for sure.